At Childers Glass, we have been serving Lufkin and all surrounding East Texas areas since 1972. We can take care of all of your glass needs at home or the office. We install commercial residential and even automotive glass. We can help with a broken window, replacement windows, custom picture frames, mirrors, framed and frame-less shower doors, screens, auto glass replacement, and even rock chips. 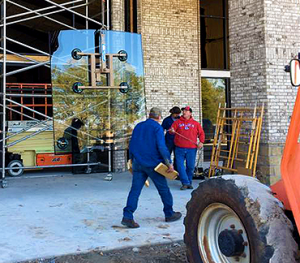 Childers Glass can also handle large and small commercial projects from updating the store front to new construction buildings. We love taking great care of our customers and treating them like family! When you choose Childers Glass, you can trust us to deliver a quality job and still at an affordable price. Feel free to contact us today to start a free estimate. 2017 © Copyright Childers’ Glass. All rights Reserved.